Mesmerizing animation by Xavier Chassaing that imagines light traveling through an environment of cacti and canyons, moving from hidden caves to lonely cliffs. The lights appear organic as it travels erratically without any known destination eventually covering the desert in a sea of pulsating lights. 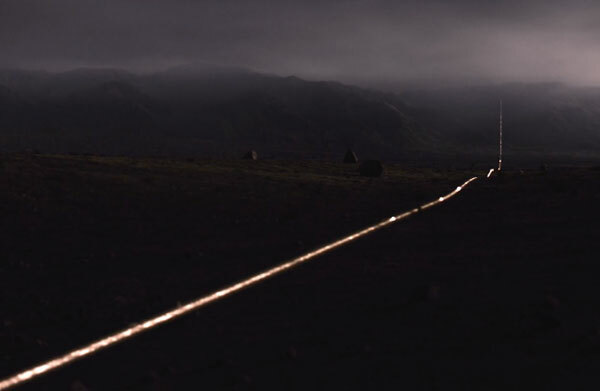 This experimental film lies somewhere between a site-specific installation and a performance, where choreographed lights meet organic landscapes. Like an imaginary city flickering in the dark, the lights beacon fragments of vague memories—faded moments, experiences, and topographies. A world in an erratic state of flux that seems to evade any grasp of clear control plays host to constantly alternating physical and mental landscapes. Moving without a destination in the dead hours of night, mesmerising, intermittent apparitions illuminate their surroundings, allowing personal narratives to breed.